In their efforts to create an action plan for realizing their Community Vision, the PCW Steering Committee decided to supplement the socioeconomic profile (see previous chapter) with a survey that would provide a baseline assessment of the current state of the PCW community. As the socioeconomic profile provides an objective snapshot based on demographic and employment data, the community survey offers a perspective of the community from its own residents and employees. The survey was developed to correspond to the ten community vision statements that together address the three broad themes of the State of the Watersheds Assessment: Quality of Life, Economic Vitality, and Environmental Integrity. The community survey focus areas were adapted from the ten vision statements, identified by the PCW Steering Committee, by extracting measurable key concepts from each statement (Table 1). For each focus area, several indicator characteristics were identified and formed into statements, which were assessed using a Likert scale (scale of 5). 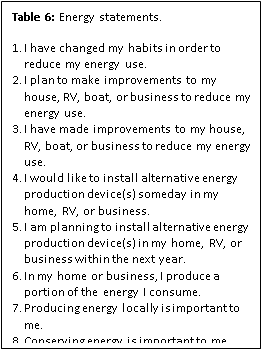 Along with these 50 Likert statements, 15 Yes/No questions were asked in the Energy focus area. In addition, 12 optional questions inquired about demographic information to aid the interpretation of survey results. In recognition of the high inflow of employees who live outside of the project area, as well as high rates of renters and “live-aboard” residents (see Socioeconomic Profile), staff selected two survey distribution formats to ensure all sectors of the community were represented. Postcards were sent to landowners in the PCW area that included a brief description of the survey’s purpose and a link to an electronic survey, hosted by an online survey website called SurveyMonkey. Postcard recipients could also request a paper version of the survey mailed to them at no charge. Of the 1,173 postcards sent, 77 responses were received through this distribution method. The second survey format was verbal administration by an AmeriCorps National Civilian Community Corps (NCCC). Over the course of four days, the crew went to boat docks, convenience stores, mobile home parks, and common lunchtime locations to survey 84 local workers and non-landowning residents. After discarding empty or incomplete responses, the total dataset consisted of 155 survey responses. Survey response data was analyzed individually as well as cross-referenced with demographic traits to identify trends. The sample size was admittedly too low to ensure scientific validity of the data, a result of financial and logistical restraints. Overall, survey responses indicate a medium quality of life in the PCW area. While people appreciate abundant recreational opportunities and the small town atmosphere, their responses indicate considerable room for improvement in areas that play an important role in the livability of the community. 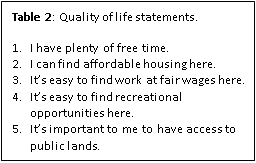 Across all demographics, survey responses indicate a medium quality of life with respect to the indicator statements (Table 2). There is particularly strong consensus that there are many recreational opportunities and good access to public lands. However, results indicate that it is difficult to find fair wage jobs in the project area, even among respondents in higher income brackets (Figure 1). Likewise, results indicate that the local education system needs improving. Most of the survey respondents, especially females, feel that local schools are poor in quality (Figure 2). Figure 1: Percentage of community member respondents showing their level of agreement with this statement pertaining to fair wages, when cross-referenced with their income status. Figure 2: Percentage of community member respondents showing their level of agreement with this statement pertaining to quality of schools, when cross-referenced with their gender. 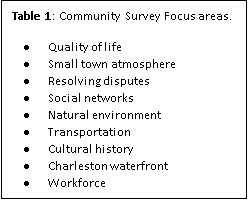 Across all indicator statements, responses show that community members feel the PCW area has a small town atmosphere (Figure 3), which is an important characteristic to the community. Figure 3: Responses from surveyed community members pertaining to small town atmosphere statements. Details: Certain groups raised safety concerns, specifically younger people and individuals with a higher income. Additionally, recent newcomers and people with an unstable living situation are less familiar with their neighbors. The overwhelming majority of respondents across demographic categories feel neutral about the community’s ability to resolve disputes collaboratively, effectively, and resourcefully (Table 3). Additionally, results indicate that many people don’t know about conflict resolution resources, suggesting either a lack of such resources available or poor communication about them. Most respondents feel that community engagement is important, but many don’t get involved in the opportunities that exist (Table 4). Retirees and the unemployed in particular are less active in the community. The diversity of the PCW community is less conclusive; while certain sectors, such as the 18-22 age bracket, feel the community is more homogenous, other groups feel it is quite diverse. Based on survey results, the community has diverse opinions about the public transit access in the PCW area, without clear trends for any specific demographic (Table 5). Such inconclusive results point to an opportunity to improve public transportation. 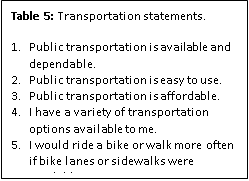 There is, however, clear support for special lanes and sidewalks to promote biking and walking. Community survey results indicate a robust and resilient economy in the PCW area, with broad support for economic drivers, such as an attractive waterfront, cultural activities, and alternative energy production. Survey results show that the waterfront is a vibrant center for the community and a hub for local products and business (Figure 4). There is uncertainty, though, among respondents as to whether the waterfront is an attractive place for new businesses, which may be due to insufficient representation of potential business owners in the survey sample. 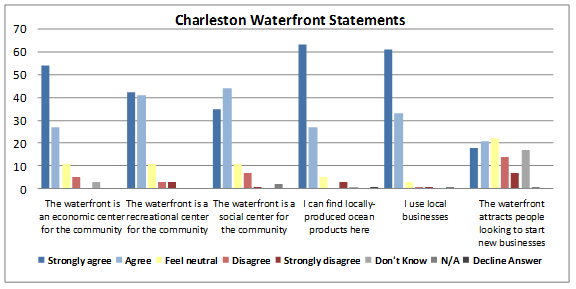 Figure 4: Responses from surveyed community members pertaining to the Charleston waterfront. Among the survey respondents who are employed, the majority have a positive perception of their job and employer (Figure 5). While the survey generated few responses from employers, those from the forestry industry find the area unattractive to businesses. Most survey respondents have an understanding of the local cultural history and recognize its importance (Figure 6). The reported lack of cultural history programming, however, suggests that there may be few opportunities to learn about such topics or poor communication about existing opportunities. Figure 6: Responses from surveyed community members pertaining to local cultural history. 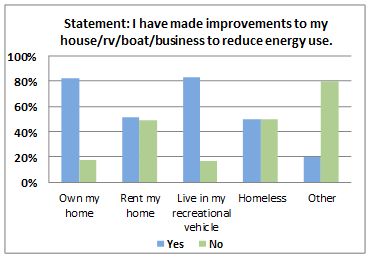 The survey results indicate widespread support for local energy production and energy efficiency, though few respondents have actually taken such actions, especially those who do not own their own home or RV, or those with limited financial capacity (Figure 7; Table 6). referenced with their housing status. Community survey results indicate almost all respondents have an understanding of and appreciation for the local environment, which they find to be in good condition (Figure 8). Participation in environmental education programs is particularly lower among respondents of 65 years or older and those who are unemployed. Figure 8: Responses from surveyed community members pertaining to the natural environment. The community survey results indicate a general agreement that the PCW area is doing well on its social, economic, and environmental factors. Responses point out only a few specific matters under the Quality of Life category that require significant improvements. This markedly positive picture, however, becomes foggy when compared to other socioeconomic data from the area. For example, nearly all employed respondents reportedly have a safe work environment. Yet a large number of PCW area jobs are in industries with high levels of workplace injuries (e.g., fish processing, logging, mining). Such discrepancies suggest that the community survey data may not accurately assess the state of the community, possibly due to the small sample size (n=155) and thus a misrepresentation of the community composition. However, it is important to remember that a disparity between individuals’ viewpoints (i.e., community survey results) and the situation as portrayed through socioeconomic, employment, and other datasets does not necessarily denigrate the quality of the survey data. In fact, such incongruities can shed light on community issues that have traditionally been confusing or misunderstood. Nevertheless, these cases stress the need to use caution when drawing conclusions from this survey regarding the state of the PCW community, especially without contextualization. It is prudent to compare the survey results to other data to determine which trends can be used as a sound assessment of the community’s condition; trends that appear questionable should be considered for further study. After further analysis, the Quality of Life and Environmental Integrity results seem to corroborate external data, whereas Economic Vitality indicators require additional research before they can be used for future assessments.